The property is set in five and a half hectares of olive and almond trees. There are some 650 olive tress and 200 almond. There are also pines and deciduous groves. A Casa of 120 square metres is now being offered for sale. The Casa has a lounge - with wood burner stove, a kitchen and a bedroom, thus, this part of the dwelling is completely habitable. There are also three other rooms waiting to be finished. There is also a large workshop with a new flat roof this is designed as a sun terrace. The present owner has produced his own electricity with solar panels and made use of the underground cisterna for much of his water. The nearby town of Ginestar has schools, shops, bars, restaurants and swimming pools and a bank. Ginestar is on the bank of the beautiful Ebro river - an important and popular location for the canoeist and the fisherman. The nearby towns are Mora d`Ebro and Mora la Nova - towns with good shops and places to dine - but the Mediterranean is only some thirty minutes away with several towns and markets. Reus airport - with Ryanair connections is only forty minutes drive, Barcelona is an hour by train. 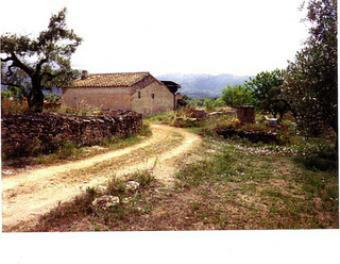 This quiet property can be used for agricultural purposes or for holidays. To appreciate the tang of the wild herbs and flowers, to enjoy the spectacular views, to experience the peace - this property is well worth a visit!